The 3rd morning we’ll pack up our shelters, have breakfast, and gather together for some last thoughts before waving goodbye. Check out our Double Jack Trip Synopsis. Our school goes to Gold Camp every other year, so my older children and husband have attended in the past. This year it was my turn and it was such a treat! The staff and atmosphere were fitting for a trip to 1854. 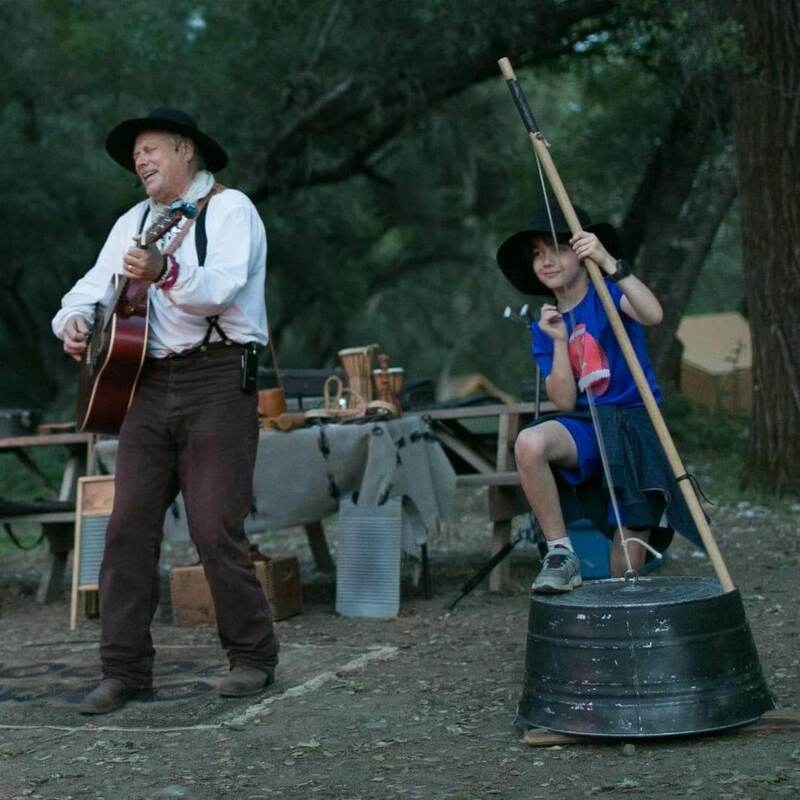 They presented many different aspects of life and a career during the Gold Rush, including the different types of mining, relations with the Natives, and the perks and sacrifices of California life. The whole experience was one I’m very grateful for! 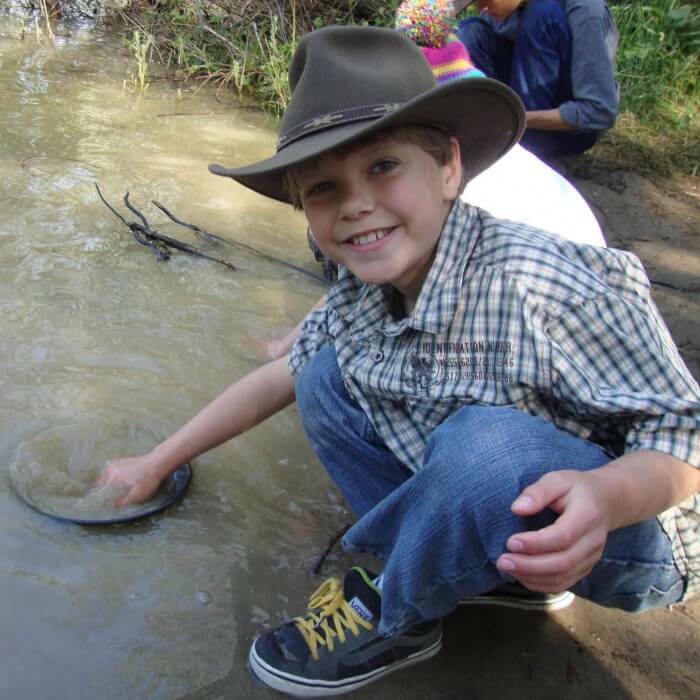 The trip was great, it is a highlight of 4 grade and learning about gold country. As always you mad the trip a delight. All my parents return from this trip saying it was one of the best “experiences” ever. Thank you for making this the highlight of my year! We had an excellent trip! I would definitely refer friends. The hosts were fun, energetic and helped teach us many new things. The food was perfect! It was very beautiful that our Christian faith was woven into the tapestry of camp from start to finish. I think even a person who came to camp lukewarm would leave on fire for the Lord or if not at least curious enough to want to know him more intimately. I loved it I had the best time with my daughter and the staff. What a cool way to learn about the history of our state. I really enjoyed meeting other students and parents that until I went to Rock n Waters I only knew their names. This was my second time on the trip. I went with both kids and each time we had a great time and made some fun memories! Thank you for offering such a cool experience for our kids! My class and chaperones enjoyed the trip so very much! All activities were appreciated and everyone had a grand time. The candle making activity ran out of time so the kids’ candles were quite thin, but they did enjoy doing what there was time for on that day. I love the Job’s tears and Bible stories relayed while making the bracelets. My hardest part of each trip is setting up and taking down our camp area. If there was 30 minutes extra for set up and take down, that would be helpful. But maybe I’m the only one who feels that way and am just slow! It isn’t a huge deal, just a suggestion. I hope you all know how much I have enjoyed being a part of the camp for 14 years and will miss being involved. God bless you all and you will be in my prayers. Amazing! Food was excellent, programming was super fun. Only suggestion is to upgrade the shower facilities- or maybe just clean more frequently. Your staff, especially Junior, were so sweet and very enthusiastic. Even stayed in character the entire time! Thank you for providing such a special experience for our 3rd graders. Fun for kids and parents. Great way to learn about history. The staff is amazing and friendly. Had a great time! Good ppl, good food, and most of all kids singing worship songs around a fire can’t beat that! I have been coming for years and it is still splendid. Ma and her crew need to be commended for creating a wholesome atmosphere and wonderful environment for learning. Great staff, fun activities, great food. I would have appreciated a bit more respect for the adults on the trip. This may have been more of an issue with our school representative vs. the actual Rock and Water staff, but it would have been nice to know when we could expect breaks and when the program would end/begin. Waiting around on the last day was frustrating. It would have also been nice to be notified that our group would be merging with another school. Our leadership was not informed of this before hand. Also, breaking up the kids into groups right at the start for the entire 3 days without any sort of heads up was a bit unnecessary. I feel these groups should have been formed in their class ahead of time. The staff at RocknWater were just absolutely the best. They were so good at engaging the children while entertaining the adults. Emma was our group leader and she was very energetic the entire trip. Thank you again! This was the best experience. I cannot thank you engough for helping my daughter make memories that will last her a lifetime. Excellent, and it consistently has been year after year. I am still trying to figure out how many years I have been coming. 14 +/- Love that staff, food and program! The experience over all was fantastic. 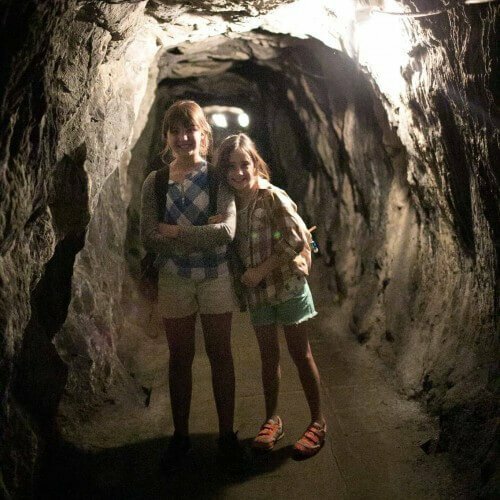 The kids had a great time exploring the mines and gold country. The full day at camp was loaded with activities that kept the kids busy. The kids also had a great time learning what it was like to live in the 1800s. The group leaders were great (we had Ma and Sheamus who were excellent). The kids enjoyed listening to their stories and lessons. We were blessed with great weather. The only negatives were the mosquitoes and the lack of knowledge of what was needed for the upcoming hikes (water need, shoe need, how long they would be, etc). Fantastic! The kids had a blast and so did the parents. It was great that they were entertained and educated the entire time. We LOVED the music guys the first night, the food was great and the activities were fun. It was neat how well Emma worked in bible stories and God related things to everything we did. Thank you to the staff for all their hard work. The trip was very pleasant. The team leaders kept everyone consistently busy with activities and regularly added a relevant message to these. I am glad that this camp welcomes our school on a yearly basis. My son, class and I absolutely loved every minute of this trip!! All of those who work for Rock-N-Water were kind, knowledgeable, fun and thoughtful. I am a first year 4th grade teacher and I am already looking forward to next year! There was rain and hail on our first day but as we were promised – the kids still had a blast and we were well taken care of! It was 38 degrees that first night and Ma gave us great tips on staying warm. We did everything she suggested and we were cozy all night and into the next day. What a wonderful blessing to have the men and women who work at Rock-N-Water care so much for the people who visit. From the moment we arrived to the moment we left we enjoyed ourselves, learned so much and wanted for nothing else! This was my second year to go as a parent. The first was in 2015. Both times I enjoyed myself I was able to experience new adventures with each of my sons. I enjoyed the way each staff member stayed in character. It is amazing how cooperative the students get when it comes to clean up when they are at camp.then anywhere else. You see them working together with other students they don’t know and they are having a blast. My children still talk about camp and other students I’m around talk about the experience they had. It is a wonderfully positive experience that includes a side of something educational. They are learning and having fun and eating well. Thank you. I would like to one day try the other camps you have available, like the white water and family camp. Had an amazing trip – learned a lot (still trying to find more miner’s lettuce to munch whenever we hike), the food was great, and even doing dishes were fun! All was great! Great staff! I’ve been coming to Rock ‘n Water with my 4th grade class for 11 years. This is the absolute highlight of the year for our 4th graders. They always think I am exaggerating about what a great trip it is, but then we go and they understand. It is so well organized, so entertaining, not to mention the fact that it has a wonderful spiritual emphasis. My repeat parents are always eager to go again, and I look forward to it every year! It was amazing. I needed this trip to bond with my step son. We were able to do this on this trip. We both had so much fun. I get to do this again with my twins in a few years. I can’t wait. Awesome program! Great people great food! Loved it. Great employees, God-focused, mission accomplished. Thanks for such a wonderful experience with my daughter! I’ve been to 3 other Christian Science camps with my children and loved them all, but Rock N Water was by far my favorite. They do an amazing job beginning to end. To say I was impressed by your staff would be a gross understatement. This is an incredible ministry and I will DEFINITELY be back with my entire family! What a great camp! All the counselors were fantastic (our team leader was Sunny… That guys is rad!). Kids were kept busy and engaged. Food was tippy-tops! Your Living History 49’er fun has been consistently wonderful year after year! The program is fun and informative for the kids. The staff is impressive, and the food is great! I have no complaints and I feel that the 4th graders from my school would be robbed of a memorable experience if they didn’t get the chance to go…so we keep coming back! The food was great. The bathroom facilities were surpringly nice and convenient. The staff were helpful, enthusiastic, and very knowledgeable. My only “creative criticism” would be to consider slowing down the pace of the activities. While everything was fun and informative, the schedule was pretty jam-packed. I’m sure other groups might have found it just right – or even too slow! – but the kids and adults in our group got pretty overwhelmed near the end of both days. It was an awesome experience. My lil girl was filled with love and knowledge the entire trip! Memories to last a life time! Great program for the kids and whole family, beautiful location, friendly staff, delicious food.Thanks!! I think Rock-n-water provided a great experience for my son and as well as for me. The counsellors were great and friendly, the food was good, the activites were engaging. It had a Christ-centered focus. I would recommend it to anyone. Thanks to you all! Everyone had an excellent experience. We really enjoy coming and spending the time in the outdoors. The hands on activities keep the kids busy and interested. 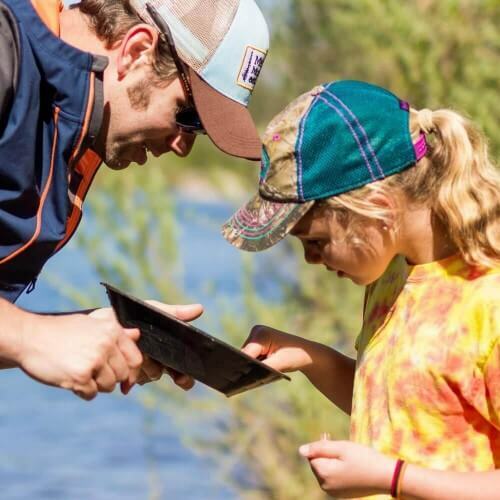 The more the guide can engage them and use the time, the better! My experience was absolutely exceptional. I enjoyed every single minute and will cherish the memories made with my 9 year old daughter. It was amazing and full of learning while having fun. I am so appreciative of all that was done for the kids and families. Superb and so great for the kids. I can’t say enough good things about my experience. Every activity was great ! The band on Wednesday night was terrific. The staff was incredible – what great role models for our kids. Keep up your great work. Fantastic ! I loved it ! And so did all the kids. Many thanks and much appreciation for making this opportunity available !!!!!! It was wonderful. One thing that would have been helpful would have been to know the difficulty levels of the various hikes. Also to have the same guide throughout our trip would have been nice. Our guide (Jess) seemed less experienced than our original guide (Liberty). I thought the camp was well run the staff were terrific and the activities were a lot of fun. Even with a rainy and muddy first day, our group had a wonderful experience! Liberty was an outstanding guide and we wish she was able to stay with us the second day but completely understand! I have nothing but wonderful things to say about her – extremely professional, personable, knowledgeable, and really related to both the kids and adults. She brought the whole Gold Rush experience to life! I can not recommend her more! As for the camp itself, I have been telling all my friends what a wonderful time we had and would definitely return (even though I was originally I self proclaimed, “non tent camper!” Also, I thought the food was delicious, the staff courteous and professional, and the activities extensive and engaging. I got very tired of eating chicken for EVERY single meal! Rock-N-Water is an outstanding experience for my students both those who have experienced tent camping and definitely great for those who have not. This program is Christ centered, organized, and fun for child and adult alike. I encourage all my students and parents to attend. 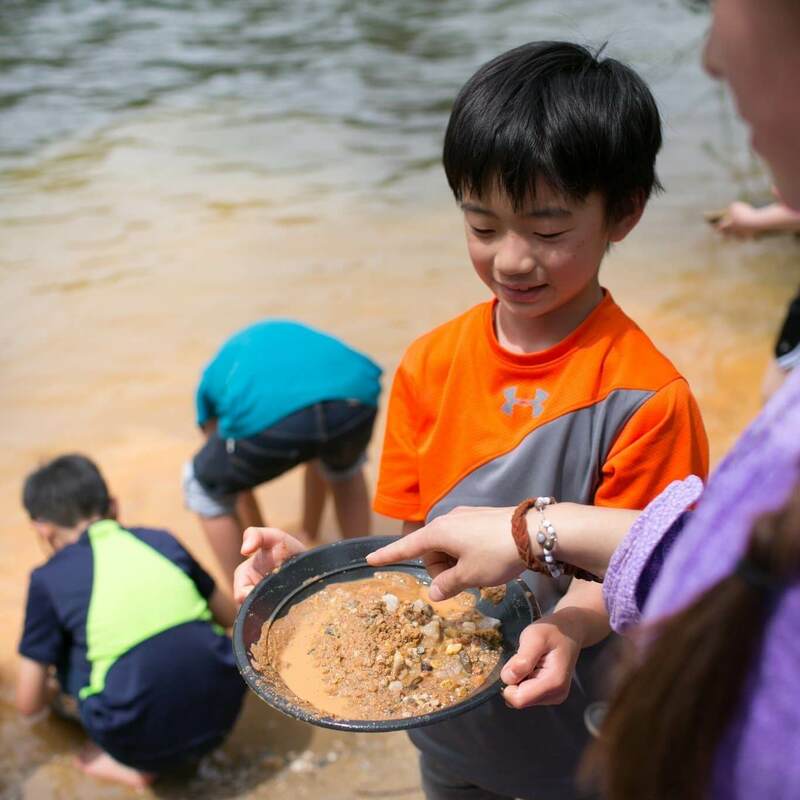 Rock-N-Water is a field trip that will be remembered for years to come. 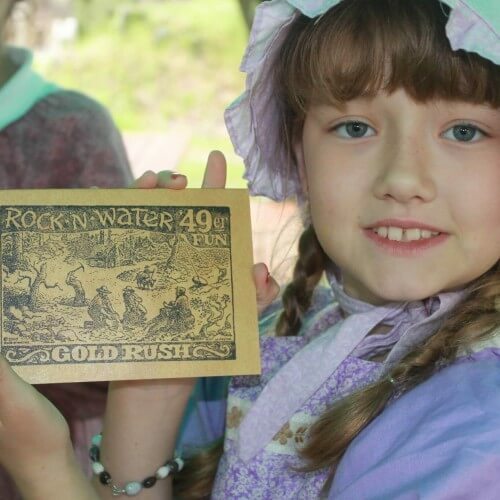 I would recommend any 4th grade teacher to take their students to Rock-N-Water, where the students will learn about California history and that God is Great than gold. Well organized, focused on valuing each individual as a child of God, fun, moderately educational. Great food. My memory is that the “characters”of the leaders used to be more developed and consistent. I miss that, but new attendees are happy with the leaders they do meet. Always a great time and growth opportunity for our students. Amazing trip! Staff was friendly and professional, and the facilities far exceeded our expectations. The food was awesome! Rafting and fellowship were so much fun! Would absolutely recommend Rock-n-Water and hope we can come back again. Very much enjoyed the food and our group leader was terrific! We had a wonderful experience! MJ was fantastic. I have been coming to Rock n Water for 12 years, and 4th grade 49’er camp has consistently exceeded all expectations! I would recommend this camp all 4th grade teachers! I had a wonderful experience with my daughter this past week. The cook was very accommodating to some personal food issues and I didn’t feel as I was bothering her. I can’t wait to go back and share the experience with my son in 2 years. Your camp is amazing!!!! So much fun for the whole group. We had MJ as our leader and she was polite, knowledgeable and fun to be around. She treated the adults with respect and was kind to the kids. The food was great and the facilities better than expected. The activities were perfect and I was surprised that we got to do so much in such a short time, the kids had a blast and we all learned so much. Thank you, thank you, thank you!! My only thoughts for improvement would be to have a little free time built into the day so the grown ups have some down time and the kids can run and play with their friends. Also if there is a way for the camp staff to come around at 10pm to enforce the curfew. Otherwise it was an amazing experience and one I would highly recommend. Please give MJ a special recognition…as well as her co-workers, for such young people they are amazing. The kids (and adults) need more breaks/down time especially if it is really hot. It was awesome! Everyone had a great time. MJ was very knowledgable and the kids loved her. The food options for those with allergies was very accommodating. The facilities are clean. I’d go back without question! Thumbs up for how hard the staff worked to keep everything on track. Perhaps there was too much crammed into a small amount of time? The hikes were nice but there was no down time at all so it felt a bit frantic. The kids get recess at school, it would have been nice to allow them and the parents a few minutes to relax especially on the first day once we arrived at camp. What an amazing trip for me and my daug hut er with her 4th grade class! The two mig ur stay was jam packed with fun, learning activities, and Christ based friendly environment! Special thanks to our guide, Lawrence! He was so informative, lively, and a blast!I thank each and every staff member for all there hard work, dedication, and love for what they do! We now have memories for a lifetime! We had an amazing time this past few days. So many fun activities, guides were amazing, food was yummy. We loved the two fellows who did the live entertainment. Everything A+. 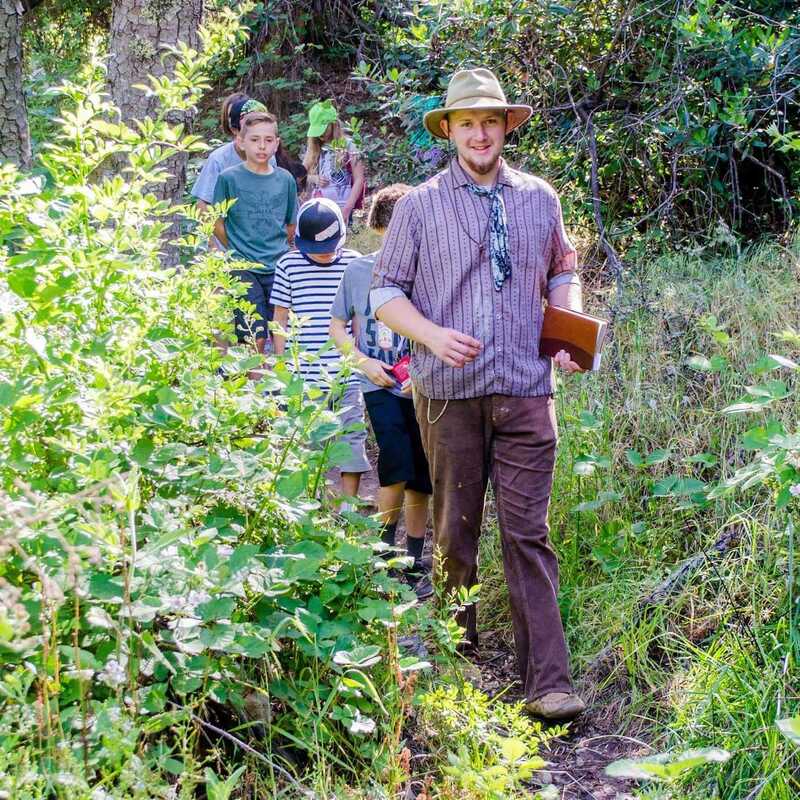 My only concern was that during our hike to the river, the guide (Jr.) & six children walked right past, almost stepping on, a small rattle snake that was coiled up in the middle of the trail!! A child noticed the snake! The guides mentioned never seeing a snake on the trails but they should have been more aware. Thank God for looking out for the youngin’s that day!! Other than the snake, we had an amazing time. THANK YOU!! This camp was a wonderful introduction to the gold mine era. They resourcefully combine state park facilities and a private mine with crafts and stories from California’s gold rush days. This was one of the best campaign experience that I had and your staff is great and they provide a lot of information for us and the kids, most important that you make our experience fun and very proactive for all of us. The food was excellent and I will recommend this program for my friends and family. We had a amazing time at Rock and water. The kids learned so much and had a great time exploring. Everyone and everything from our Bible studies, quiet time on the trails to the delicious meals and your great staff were fabulous and I will highly recommend you to others. Thanks for everything. I truly enjoyed the 2 night camp with my kids’ school. I have gone two times 3 years apart and I continue to have a good time with the experience. Quality and fun program! We enjoyed going with all three of our children. Each trip was a time for building special memories. Thank you! We had a great time at Rock-N-Water, thank you for providing such an amazing experience for us! Your staff was attentive and responsive to our needs. You can tell that the team you have assembled loves the Lord, the students coming through your program, and the opportunity to educate. The only, very minor, thing I would have changed, was having coffee out earlier than 0800 for the adults. Emma, Junior, Lawrence, and the rest of the team were amazing!!!! Thank you for everything you all do up there. Pepper was a great camp host and leader! Wonderful, excellent staff & program. It was good. But I do not agree about we can not swimming even with supervition of the staff. amazing. I had a wonderful time. fantastic. I really enjoyed the entire, overall experience. The activities were relevant and interesting. The kids all commented how much they enjoyed their time at the camp. I found that the staff was extremely helpful and worked well with the students. The setting felt safe and was great for camping. Knowing that this was a safe and caring environment for the students was a great help! I only have a couple suggestions. While I did appreciate the Christian atmosphere (being a Christian school of course), I would’ve also liked the students to hear more history as well as the Christian metaphors and parallels. Also, this may have been miscommunication on my part but the food didn’t always meet my students’ needs. Supper and lunch were fine but the breakfast didn’t have enough choices for my more limited students who needed more vegetarian options (as I said though – that may have been miscommunication on my part. Thank you for a wonderful time! I’ve been talking about to all my teacher friends and letting them know it was a great educational experience. We look forward to going again next year! overall the experience was one that my son and I will never forget! Everyone was great and food was good too!! 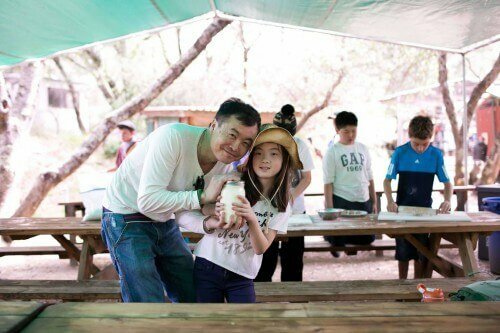 My daughter and I had a good time for the most part, and were happy with the facilities and the accommodation of special diet needs. One thing that caused us some discomfort however, was how some of the songs and skits made light of animal cruelty (dog/cat sausages, burning chicken’s legs, rabbits chased for stew). People laughed but we found it unfunny for Christians to normalize violence toward animals. My daughter also asked to duck out of the leather trinket-making activity because she knows the unnecessary cruelty behind leather. I understand the whole theme of your camp to be experiencing life in the past, but the reality is we are in 2016, and we have better options. I try very hard to teach my child to honor God by treating the vulnerable with mercy, compassion, and respect – God’s animal creation included. It was great, especially for the kids. Emma and the gang were great! You need to deal with your parking situation. I did not like wondering if all our stuff would fit back in the few cars we were allowed to bring. Clearing the poison oak back off the trails would be nice too. It all worked out fine though and the kids had a great time. Mosquitos were a real problem in my opinion. Not sure if there is a way to eradicate them but very uncomfortable during campfire and hikes. The experience was good for kids and adults alike. I think it is critical that camp staff continues to encourage/require parents and adults to participate in activities and games. It makes it a fun experience for all. The counselors were great. The silly songs and skits are awesome and we should keep those in but also…One thing I would like to see more of is the worship/devotional times at the campfires. We only sang 1 or two songs and on top of that, they weren’t songs the kids really knew. It was great time for us in the 3days camp. Both kids and parents enjoyed every moment during the camp. I really want to recommend this camp to all my friends and families. It was wonderful! The staff was amazing! The food was good, and hearty to keep us going. The entertainment was fun, and as my son said, even the crafts were fun! (We’re not crafty people) It was such a positive experience that my son didn’t want to leave and swears he will work there one day. Thank you so much for a memorable time. One of my favorite activities was beading in the tee pee and listening to the story of Job. 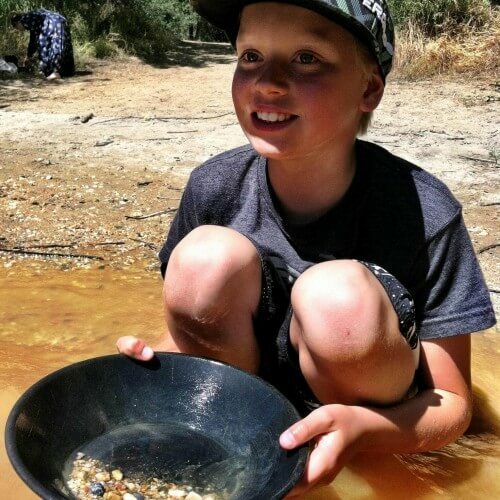 My son’s was panning for gold. We visited for a Double Jack California history program. The food was excellent. The staff was hospitable, knowledgeable, and fun. The program was incredibly well designed and delighted all the children in our group. Extra props to Anna, our guide! She was top-notch! Attended a school field with my daughter and had a great time. Was able to learn a great deal of gold mining history and remain faith based throughout the whole experience. Loved every minute of it. The staff is amazing. Such awesome customer service skills. I visited with my son’s class for a overnight field trip experience. We have our postcard that was sent and still reminisce about the great time we had at Rock -N-Water. 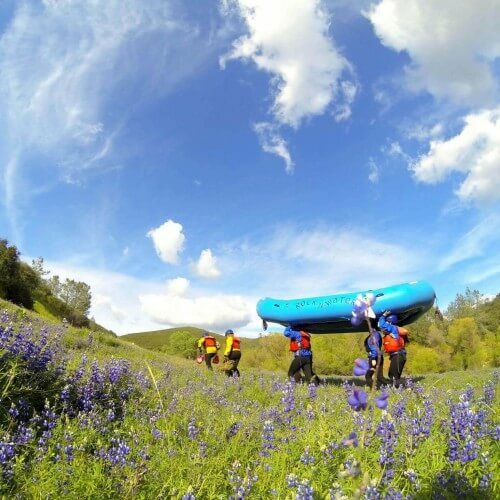 The tasty food, the fun camp fires,the many activities, our experience on the river. This field trip is an incredible educational journey into our states history. Every time (And I mean EVERY time) I went to the Rock N’ Water facilities I was welcomed like family. These are wonderful people and I cannot highly enough recommend them to you. No matter what your group, event, or adventure might be – Rock N’ Water can help you and make the experience fantastic! More gluten free menu options. They are easy: GF pancake mix, French fries, potatoes, rice, and don’t bread the chicken and meats. My students and I loved the experience! Was this the 49er camp? If yes, then it was lots of fun. Every year has been great for the 11 plus years I have visited. Consistency is one of your strengths! Every year, my student’s parents are pleased, and tell me that they have a great time, too.